Okay, kiddies, the Q. I’m grappling with these days is this: Will I ever be able to just, y’know, die? See, yesterday a.m. I made all the arrangements with one of my army of ticker docs to have him implant a defibrillator in my chest. The medics have discovered a bit of a tendency for my left ventricle to go into a flutter now and again. Usually, the flutter lasts a second or two and then the heart muscle goes back into its groove, like a bass player. But once in a blue moon, that flutter may last. And it’d be my last. 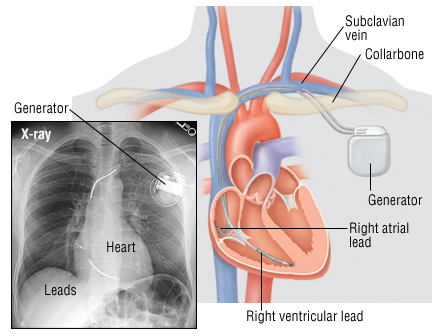 Ventricular fibrillation is a killer, literally. The heart starts crackling like a string of firecrackers in a Chinese New Year parade and next thing anybody knows, the possessor of said wacky heart is on the way out of this mad, mad world. You all have watched enough emergency dramas to know that medical personal dig putting paddles on whacked out people’s chests and zapping them back to life. Which, by and large, is a Hollywood conceit. Most people whose ventricles go crazy, well, they die. Only two or so percent actually go back to full and productive lives. That’s because in the vast majority of cases, by the time someone comes by with the zap paddles, the victim’s brain has been deprived of oxygen for so long he or she’s as good as gone anyway. Now I’ve learned my heart can go aflutter at any moment. And I’m not talking about when The Loved One walks into the room. I’ve been traipsing around with a congenitally malformed heart since I came aboard this goofy planet. Its effects began knocking me low some 15 years ago. It took the great minds of medicine a few years to determine I was born with Hypertrophic Cardiomyopathy. Because of that, I have Congestive Heart Failure. That’s why you see me walking with a cane now and again. Woo-hoo, right? At least I’m alive. But since my heart muscle cells are so jumbled, I’m reasonably prone to ventricular fibrillation. I wore a heart monitor for 24 hours a couple of weeks ago and the results were a shade alarming. It turned out I had a couple of flutters in that single day. That’s Russian Roulette, babies. The next one, as Fred Sanford would say, could be the big one. 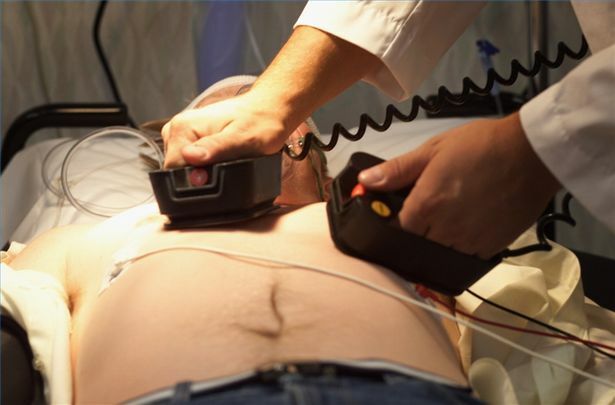 Ergo, the implantable defibrillator. Slightly bigger than an old Zippo lighter, the implant will give me an 800-volt jolt if my ventricles go ker-flooey. The doctor says it’ll feel as if I’d been kicked in the chest by a horse. But at least I’ll be alive. As I said, woo-hoo. Now the question occurs to me: Will this device keep zapping me indefinitely even when I’m into my 80s and 90s? How about my 100s? Hell, I may never die! Wasn’t there a Greek myth about that? Will I become as Tithonos, the lover of Eos? 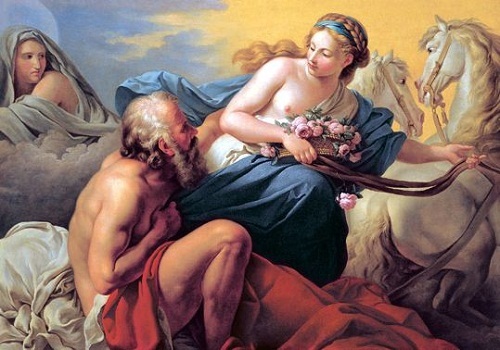 She forgot to ask Zeus to make Tithonos eternally young even as he continued to live forever. He simply turned into a babbling, immobile, decrepit thing, not the vital, vigorous lover she’d hoped for. What kind of deal is that? And do I want to make it? Oh sure, I know, the battery’s going to wear out in my little immortality machine. Still, who knows how many times I’ll have cheated death by the time my defibrillator runs out of juice? I know a little bit about that. Cheating death, that is. I’ve stayed alive thus far thanks to my daily fistful of medications and an ethanol ablation back in 2007. Before the medical community figured out how to treat HCM and its partner CHF, people just up and died from it. So I’m Tithonos already. And I figure to emulate him for a few more years at least. Only I don’t want to overstay my welcome. Some people might already describe me as a babbling, immobile, decrepit thing. Cheers to your ticker keeping on with the ticking! All the best in the next phase of the treatment. And to fellow humans in general – all the best for making our time on earth the best it can be to the end. May that end be sweet and not bitter. I sure don’t want to live forever, but neither of us seem to ready to go yet. From a slightly different angle, my uncle’s take on the question of how long to live: “How much money do you need for retirement? Enough so that you have everything you really need up to the day you die, and the final check to the undertaker bounces.” Anyway, good luck!